What To Do continues to celebrate and promote businesses from the tourism industry such as resorts, restaurants, tours, handicrafts, health and beauty centres, wedding events, boutique shops and more. The company's vast range of media products consists of WTD news print, WTD touchscreens, WTD website, WTD facebook page and the WTD mobile app that will soon be launching. 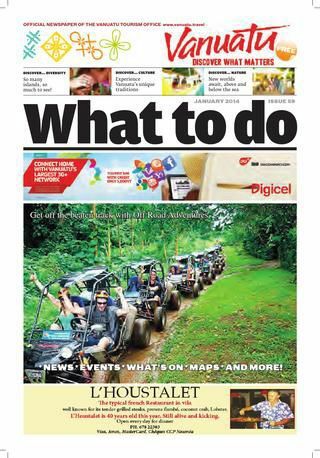 WTD prides itself as the official newspaper publication for the Vanuatu Tourism Office, working closely with and promoting tourism businesses as well as building and strengthening the relationship with VTO by sponsoring events such as Tok Tok Vanuatu. Ms Irene Abbock, VMM's Tourism Accounts Manager which manages WTD states, "We are very excited to be a sponsor of Tok Tok again this year providing media promotional services via our vast range of products to a value of Vt250,000." The organizing committee acknowledges What To Do in Vanuatu - Vanuatu Media Marketing's sponsorship and ongoing support towards Tok Tok. Visit What To Do in Vanuatu and Vanuatu Media Marketing.